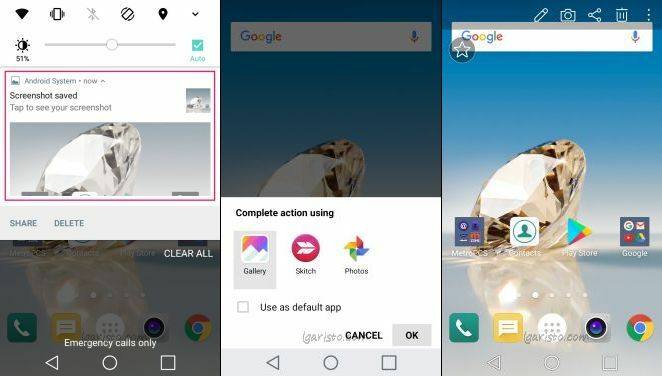 These days most of the LG phones have Anti-Roll back security in effect which makes it impossible to downgrade the firmware to a lower version. Most of the time downgrading is done for the purpose of rooting. A security update patches the root exploit and if there is no way to downgrade you fail to root your phone. However, as the bootloader of LG Aristo is unlockable rooting will never be an issue. The only purpose of downgrading in our case is to bypass google’s factory reset protection (FRP). If we downgrade the phone back to ms21010g we can easily bypass the google account. 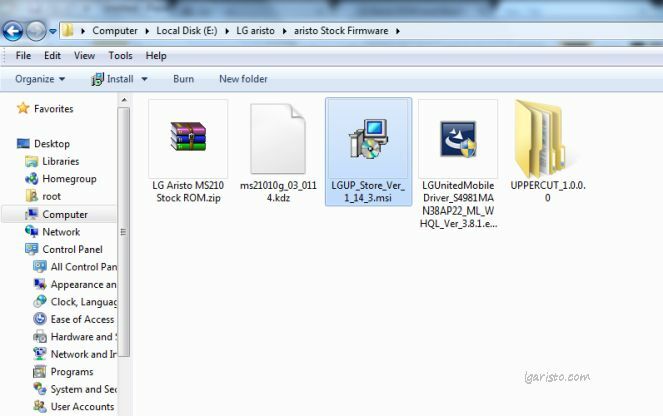 Follow below flashing tutorial to downgrade your firmware to ms21010g and then follow the LG Aristo FRP bypass tutorial to get your phone up and running. First of all, download and install the necessary files on your computer. Download the zip file from below link and extract it. 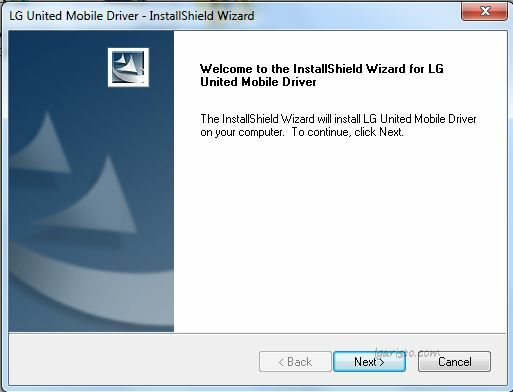 The first step is to install the LG USB Driver. Click on the file to initiate installation. Attach one end of the USB data cable to your PC. Press the “Volume UP” key on your LG Aristo. Keep it pressed and attach the other end of the USB cable to phone. The phone should be now in download mode. Let the driver install on its own. 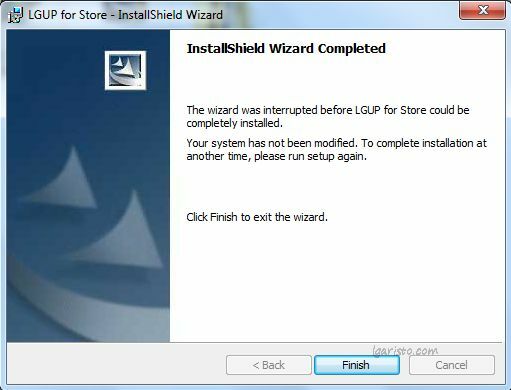 Now install LGUP Store version 1.14 as shown above. Finish the installation but don’t run LGUP yet. 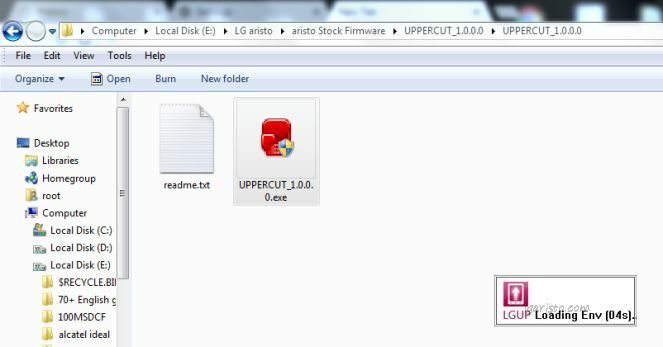 If the LG USB serial port driver is installed successfully, open “Uppercut” folder and run “UPPERCUT 1.0” file as shown above. 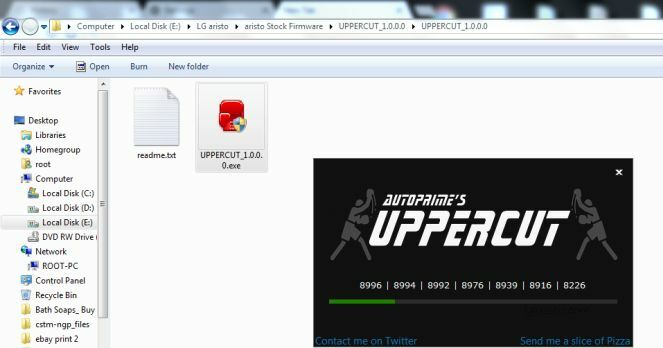 Uppercut will load LGUP software. 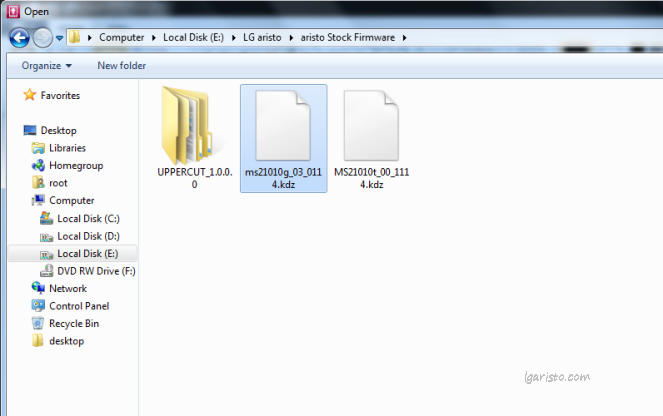 You can see my LG Aristo firmware version is visible. My aristo is running on latest firmware ms21010v. We’re going to downgrade it to ms21010g. 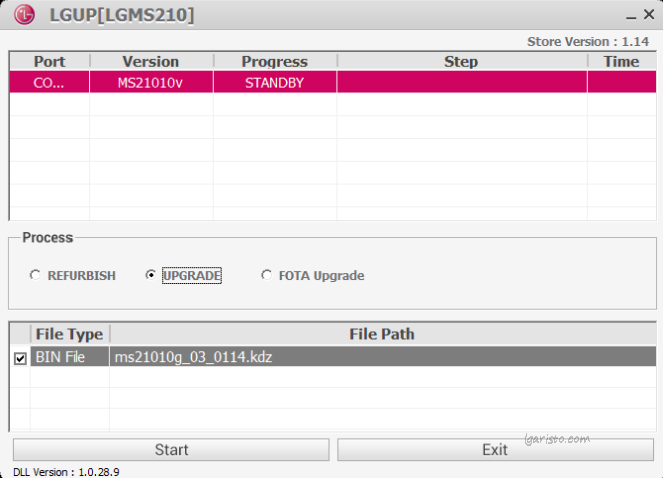 To flash this firmware click on the “3dot” icon and browse for the downloaded kdz firmware file. Double click “ms21010g_03_0114.kdz” file to load it in LGUP for flashing. You can see the kdz file is showing up in LGUP. Next step is to change the flashing process from “REFURBISH” to “UPGRADE”. Even though we’re downgrading we’ve to select UPGRADE. Now hit “Start” to initiate the downgrade process. When on 4% it says “Anti Rollback Check PASS” that means its possible to Rollback the firmware to a lower version. 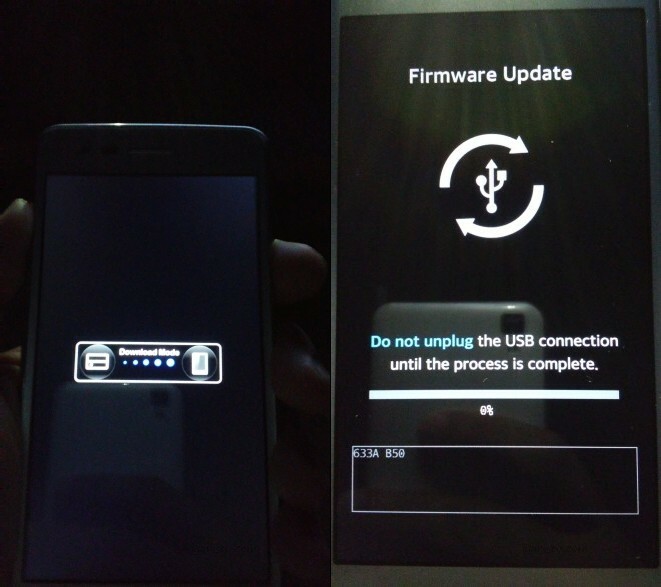 At around 80% the flashing process gets completed and phone Reboots from download mode to regular mode. Wait for the process to complete to 100%. Now we can exit LGUP. We’ve successfully downgraded LG Aristo firmware from ms21010v to ms21010g. 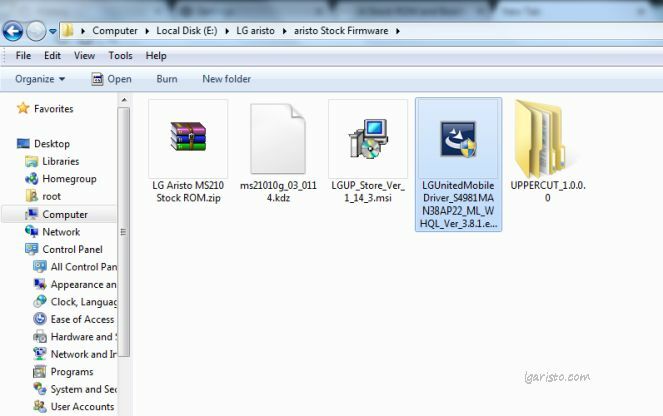 Now follow this LG Aristo google account bypass (FRP) tutorial to get back your phone up and running. If facing any issue feel free to leave a comment below. 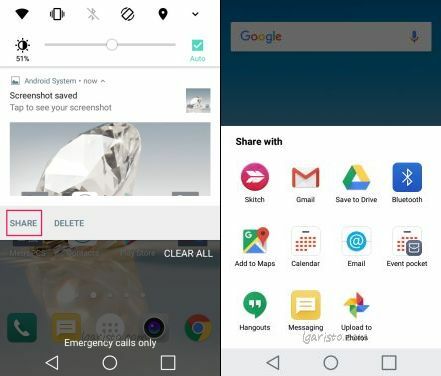 In LG Aristo you can take screenshots easily with a 2 key combination anytime. To capture a screen, press “volume down” and “power key” simultaneously. The screenshot gets saved in the “Pictures” folder. For instant viewing pull down the notification bar and click on the saved screenshot as shown above. Open it with “Gallery” or “Photos” app. Edit, Share or Delete it. A screenshot is good for a single frame but to record the screen for a longer duration we need a screen recorder. There is no native pre-installed screen recorder as of now in Android, but there are several recorders available in the play store. My personal favorite among the 4 is ADV screen recorder as it supports “pause” and “stop” with a translucent magic button. The opacity of magic button can be set and it can be moved anywhere on the screen.